DONE, A. , CAILEAN, A.-M. , GRAUR, A. This article proposes a cost efficient and easy to implement frequency stabilization method orientated toward communication systems operating in an extensive temperature range, as the automotive or the aerospace applications. The proposed solution uses off-the-shelf components and it is optimized for very low power consumption. The novelty of this article is represented by the introduction of the barium strontium titanate capacitor for quartz crystal oscillator active frequency stabilization. After the design was completed, the performances were evaluated and compared to the ones of the uncompensated oscillator. Experimental results confirmed the suitability of the proposed design, achieving 35 times better frequency stability within variable temperature conditions, whereas the power consumption is maintained below 6mW. M. Bloch, D. Leonard, O. Mancini and T. McClelland, "Emerging applications requiring precision time and frequency," 2009 IEEE International Frequency Control Symposium Joint with the 22nd European Frequency and Time forum, Besancon, 2009, pp. 364-371. J. Lim, H. Kim, T. N. Jackson, K. Choi and D. Kenny, "An ultra-compact and low-power oven- controlled crystal oscillator design for precision timing applications," in IEEE Transactions on Ultrasonics, Ferroelectrics, and Frequency Control, vol. 57, no. 9, pp. 1906-1914, September 2010. W. L. Hsieh, C. W. Chen, C. Y. Weng, C. L. Hsu, S. H. Kao and C. W. Chiang, "Development of high-stability miniaturized oven controlled crystal oscillator," IEEE Int. Frequency Control Symp. (IFCS), 2016, pp. 1-4. MinQiang Li, XianHe Huang, Feng Tan, YanHong Fan and Xun Liang, "A novel microcomputer temperature-compensating method for an overtone crystal oscillator," in IEEE Transactions on Ultrasonics, Ferroelectrics, and Frequency Control, vol. 52, no. 11, pp. 1919-1922, Nov. 2005. R. Jansen et al., "A CMOS-compatible 24MHz poly-SiGe MEMS oscillator with low-power heating for frequency stabilization over temperature," Joint Conf. of the IEEE Int. Frequency Control and the European Frequency and Time Forum (FCS) Proceedings, San Fransisco, CA, 2011, pp. 1-5. 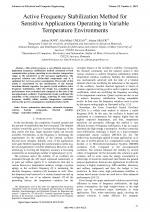 C. S. Liu, R. Tabrizian and F. Ayazi, "Temperature compensated MEMS oscillator using structural resistance based temperature sensing," 2015 IEEE Sensors, Busan, 2015, pp. 1-4. G. K. Ho, K. Sundaresan, S. Pourkamali and F. Ayazi, "Micromechanical IBARs: Tunable High-Q Resonators for Temperature-Compensated Reference Oscillators," in Journal of Microelectromechanical Systems, vol. 19, no. 3, pp. 503-515, June 2010. M. A. Lombardi, "The evolution of time measurement, part 3: atomic clocks [Recalibration]," IEEE Instrumentation & Measurement Mag., vol. 14, no. 6, pp. 46-49, 2011. R. Boudot et al., "A high-performance frequency stability compact CPT clock based on a Cs-Ne microcell," in IEEE Transactions on Ultrasonics, Ferroelectrics, and Frequency Control, vol. 59, no. 11, pp. 2584-2587, November 2012. S. Zhang et al., "A compact optical clock scheme based on caesium atomic beam," IEEE Int. Frequency Control Symp. (IFCS), New Orleans, LA, 2016, pp. 1-4. A. Cailean and M. Dimian, "Current Challenges for Visible Light Communications Usage in Vehicle Applications: A Survey," in IEEE Communications Surveys & Tutorials, vol. 19, Issue 4, pp. 2681-2703, 2017. T. Piovesan, H. C. Sartori, J. E. Baggio and J. R. Pinheiro, "CubeSat electrical power supplies optimization  Comparison between conventional and optimal design methodology," 12th IEEE International Conference on Industry Applications (INDUSCON), Curitiba, 2016, pp. 1-7. A. Victor et al., "Noise characteristics of an oscillator with a barium strontium titanate (BST) varactor," in IEE Proceedings - Microwaves, Antennas and Propagation, vol. 153, no. 1, pp. 96-102, 6 Feb. 2006. C. Kong, H. Li, X. Chen, S. Jiang, J. Zhou and C. Chen, "A Monolithic AlGaN/GaN HEMT VCO Using BST Thin-Film Varactor," IEEE Trans. Microwave Theory and Techniques, vol. 60, no. 11, pp. 3413-3419, Nov. 2012. V. Lee, S. Lee, S. A. Sis and A. Mortazawi, "Switchable dual-frequency barium strontium titanate film bulk acoustic resonators," IEEE MTT-S Int. Microwave Symp. (IMS2014), Tampa, FL, 2014, pp. 1-4. T. S. Kalkur, A. Jamil and N. Cramer, "Characteristics of Voltage Controlled Oscillators Implemented With Tunable Ferroelectric High-k Capacitors," 15th IEEE International symposium on the applications of ferroelectrics, Sunset Beach, NC, 2006, pp. 364-367. A. Kabir and T. S. Kalkur, "Spread-spectrum clock generation with ferroelectric capacitor-tuned VCOs," in IEEE Transactions on Ultrasonics, Ferroelectrics, and Frequency Control, vol. 60, no. 8, pp. 1638-1645, August 2013. V. V. Kuvshinov, "Ceramic coaxial resonator vco with a Barium Strontium Titanate tuning element," 24th International Crimean Conference Microwave & Telecommunication Technology, Sevastopol, 2014, pp. 942-943. A. M. Cailean, M. Dimian, V. Popa, L. Chassagne and B. Cagneau, "Novel DSP Receiver Architecture for Multi-Channel Visible Light Communications in Automotive Applications," in IEEE Sensors Journal, vol. 16, no. 10, pp. 3597-3602, May15, 2016. A. M. Cailean and M. Dimian, "Toward Environmental-Adaptive Visible Light Communications Receivers for Automotive Applications: A Review," in IEEE Sensors Journal, vol. 16, no. 9, pp. 2803-2811, May1, 2016. A. M. Cailean and M. Dimian, "Impact of IEEE 802.15.7 Standard on Visible Light Communications Usage in Automotive Applications," in IEEE Communications Magazine, vol. 55, no. 4, pp. 169-175, April 2017. M. Rammal et al., "BST thin film capacitors integrated within a frequency tunable antenna," Int. Workshop on Antenna Technology (iWAT), 2016, pp. 44-47. 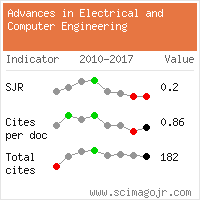 Citations for references updated on 2019-04-22 00:03 in 160 seconds.